Even though many tourists don’t seem to visit Okayama city, there is actually quite a lot to do there, making it a worthwhile place to see. Located in the Chugoku region of Japan, which is the western part of Honshu, Okayama is right on the coast and a great weekend trip from Osaka or Kyoto. Okayama offers lots of culture, and great food with its local restaurants and bars. 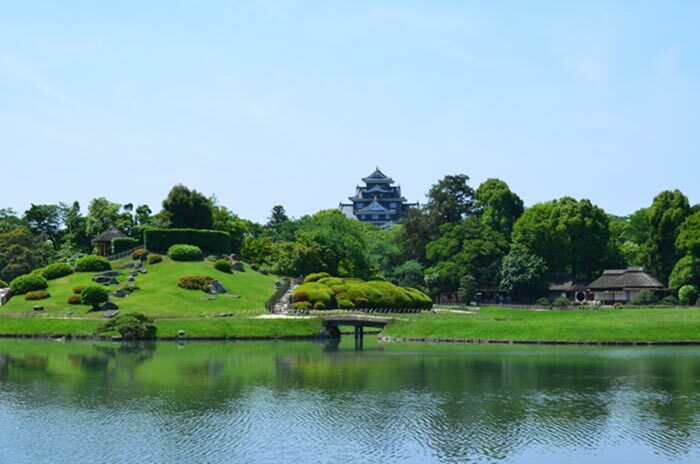 One of the most popular attractions is actually Okayama Castle and the Korakuen Garden. 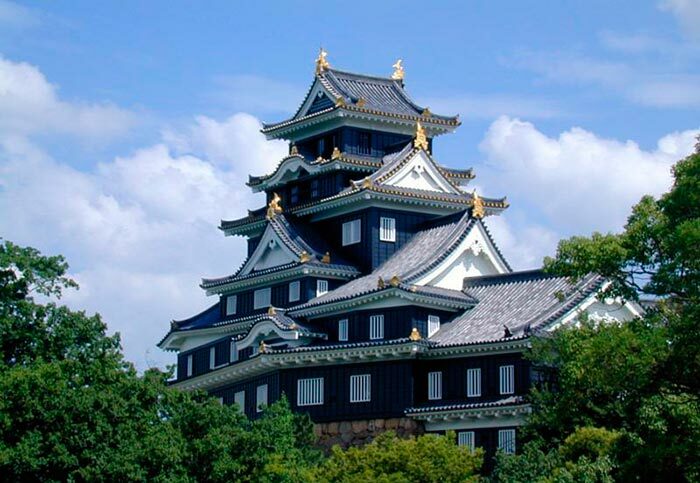 Okayama Castle is also known as “crow castle” because of its unique black exterior. 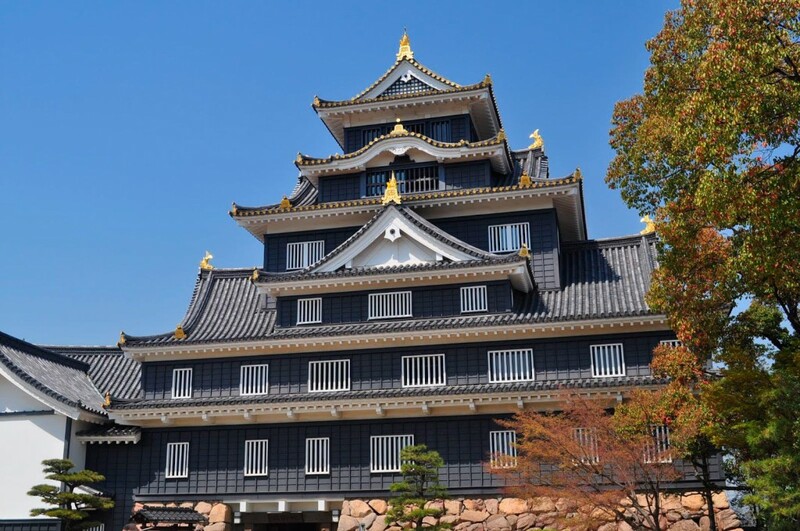 It was built in 1597 in the style of the Azuchi-Momoyama Period, but unfortunately the original castle was destroyed right at the end of World War II. A few years later in 1966, a reconstruction was made, which is the structure you see standing today. The castle is located right on the banks of the Asahi River, which was used as a natural moat. 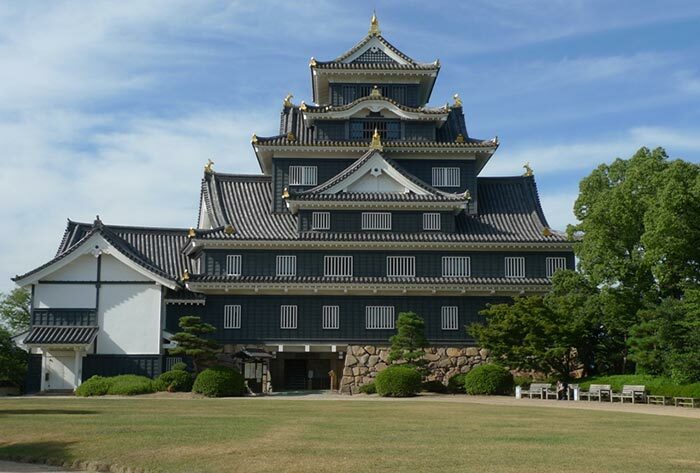 The main building of Okayama Castle is the impressive black six-story castle keep. The best time of year to actually visit Okayama Castle and the Korakuen Gardens is in the summer time. For two weeks every year, the garden is opened at night. During this time the whole area is illuminated for visitors to stroll around in. Seeing Okayama Castle all lit up at night, which its illumination is of a green color, along with the illuminated gardens is very beautiful. Even though Okayama Castle is illuminated almost every night of the year, having the gardens illuminated as well really makes a great addition. There are many places throughout Koreakuen Gardens where you can see Okayama Castle sitting high above the trees across the river. There are also many large grassy areas and park benches for visitors to sit and enjoy a picnic or a nice cold beer during the warm summer evenings. Even if you cannot visit during the summertime for the special illumination, Okayama Castle and Korakuen Garden are still very much worth a visit at any time of year.